(Nanowerk News) By combining the same Prussian blue pigment used in the works of popular Edo-period artist Hokusai and cellulose nanofiber, a raw material of paper, a University of Tokyo research team succeeded in synthesizing compound nanoparticles, comprising organic and inorganic substances (Scientific Reports, "Cellulose nanofiber backboned Prussian blue nanoparticles as powerful adsorbents for the selective elimination of radioactive cesium"). This new class of organic/inorganic composite nanoparticles is able to selectively adsorb, or collect on the surface, radioactive cesium. The team subsequently developed sponges from these nanoparticles that proved highly effective in decontaminating the water and soil in Fukushima Prefecture exposed to radioactivity following the nuclear accident there in March 2011. Removing radioactive materials such as cesium-134 and -137 from contaminated seawater or soil is not an easy job. First of all, a huge amount of similar substances with competing functions has to be removed from the area, an extremely difficult task. 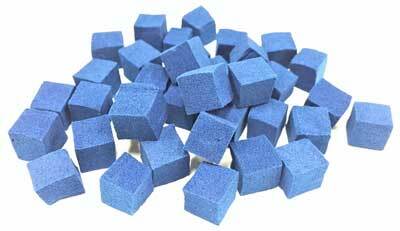 Prussian blue (ferric hexacyanoferrate) has a jungle gym-like colloidal structure, and the size of its single cubic orifice, or opening, is a near-perfect match to the size of cesium ions; therefore, it is prescribed as medication for patients exposed to radiation for selectively adsorbing cesium. However, as Prussian blue is highly attracted to water, recovering it becomes highly difficult once it is dissolved into the environment; for this reason, its use in the field for decontamination has been limited.